Hey folks! Thanks for joining me again today. If you missed Part 1, you can catch it here. Today I am going to be sharing my own struggles with parenting as an introvert and suggesting ideas on what we can do to get out of our occasional “funks”. I thought this would be as good a time as any to write about this subject because I've been having a particularly difficult week. I'm one of those weird INFJ's* who is introverted, but still kind of extroverted and wants to get out and do things, even though it wears me out in all aspects. So, most of the time I can overcome my introverted, antisocial side and force myself to get out more for the kids' (mainly my 3 year old's) sake, but lately the introvert monster has been winning. Maybe it's just the gloomy, rainy weather we've been having, but I have not been able to make myself do anything “fun” this week. Usually I look forward to getting out of the house, but not this week. I have just not felt like being around people in general. I was also excited to go to the summer kick-off party for our playdate group this Saturday. But, I was already wanting someone to at least watch Myka one weekend soon so that hubby and I can actually spend some much needed alone time for our anniversary. (He is even more introverted than I am and we really do need the alone time!...Especially since a certain 3 year old is no longer taking naps. :/) But, since this is the only weekend for awhile that my mom will be able to watch her, I decided to drop her off for the weekend instead of going to the party since I'm already being antisocial Annie. I've not been this bad for awhile. So, I'm taking it as a sign that I truly need a break, so I don't feel quite as bad for skipping the playdate party festivities in return for Myka spending the weekend at Gigi and Papaw's. 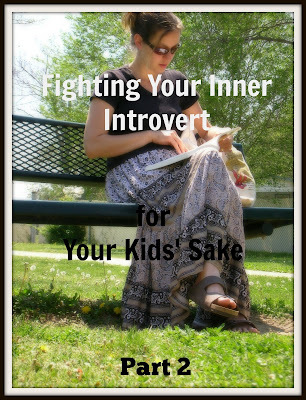 So, what's an introverted parent to do? In my opinion, all the alone time and help you can get, the better! Try to make at least a little bit of time for JUST YOU each day, even if this means getting up extra early or staying up a little late. (I'm writing this at midnight and the solitude is making me feel much less stressed out, not going to lie!) A nice, hot shower all alone without kids interrupting is heavenly too. Pop in a movie and away you go! I've always enjoyed collecting my thoughts during this time, personally. A reliable babysitter is crucial, whether it be a family member or other trusted person. Trust is the key here, otherwise you'll just worry about your kids the whole time, and that kind of defeats the purpose of having a sitter and relaxing, right? Even after I stopped working at a regular job, I still very occasionally had a trusted sitter watch Myka when it was just her. Again, everyone needs alone time! MAKE YOURSELF DO THINGS FOR YOUR CHILDREN! If you don't, you'll probably regret it at some point. I am starting to dread Thursdays (aka dance class days) more and more each week, but I see how much Myka enjoys it, therefore I make myself go. Because as parents, it's not always (and usually not) about us: the kids come first and foremost. Do you struggle with being a “mom hermit”? What do you do to try to get over it? *Check out either of these websites if you would like to learn more about the Myers-Briggs personality test and/or find out what your personality type is! Oh wow! I've never been quite that bad, but I have found that I am getting out of my "shell" more now that I have kids too. Thanks for stopping by! These are great points. Believe it or not I am also an introvert. I think that's why I like writing as it gives me full space to be who I am. I know what you mean. I love creative writing and miss it. I've been trying to catch up on blog reviews so I can get back to a story I started over a year ago. ha ha Thanks for stopping by!